This product is delivered to you electronically, and you will receive the most up to date version. They can be used by teachers in lessons to make explanations of topics clear to pupils. They are unlocked, hence making them fully editable if desired. Maths Topics is a once only purchase, which means you can use it for a lifetime in your school. 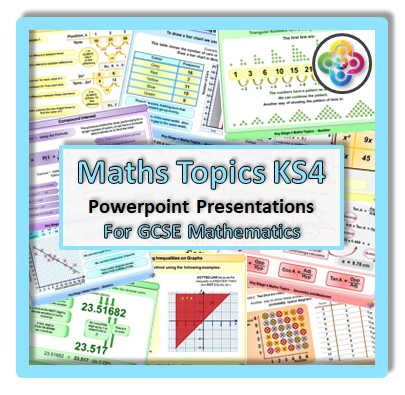 You may copy the files onto school networks to which staff have access so that they can use the presentations in their lessons. Staff may also put the files onto their own PC for use in lesson planning (although these must be removed should that member of staff leave the school). The files may not be placed on any network to which there is general public access, and they must not be loaned or passed to other schools or organisations.